Salty, hot, and delicious, the French fry is arguably Alabama’s favorite side dish. These tasty fried potatoes complete just about any meal or make the ideal snack on the go. Whether you like them big or skinny, skin-on or peeled, salted or seasoned, you’ll want to eat your fill at these 10 best places for French fries in Alabama. There’s a lot that Fig Tree Cafe and Catering does right, but fans agree you should not leave without indulging in their truffle fries. These slim-cut fries are lightly tossed in truffle oil and seasonings to give it a unique flavor you simply can’t find anywhere else. Their menu is chock full of the most delicious seafood and steak dishes in Alabama, so it’s only fitting they also serve the best fries to make every meal extraordinary. Take a trip to the Wild, Wild West with Butch Cassidy’s Café. You can always expect the thrilling taste of their fries. Thick, crispy potato wedges are seasoned and cooked to order, and pair perfectly with their award-winning burgers and wings. Or, order them a la carte with some chili and cheese for an addicting appetizer. Have you ever heard of Porky Fries? If not, they’re what your life has been missing. This creative dish combines their tasty crinkle-cut fries with a heaping helping of shredded pork barbecue, sauce, cheese, and bacon bits that’s a food lover’s dream. It’s just as big as it sounds, so make sure you bring a heavy appetite. Find locations in Sylacauga, Alexander City, Pell City, Wedowee, and Chelsea. Great fries rely on great condiments to craft the best possible flavor. This downtown eatery makes their own ketchup to make their hand-cut fries simply the best. You won’t find a better combination anywhere else. No one knows their way around a potato dish like the Mulligan’s. This classic pub has the best spiral cut fries in the state. Pair them with your favorite brew to get the full experience. As a restaurant specializing in Mediterranean and Middle Eastern cuisine, this place provides a unique take on fries. 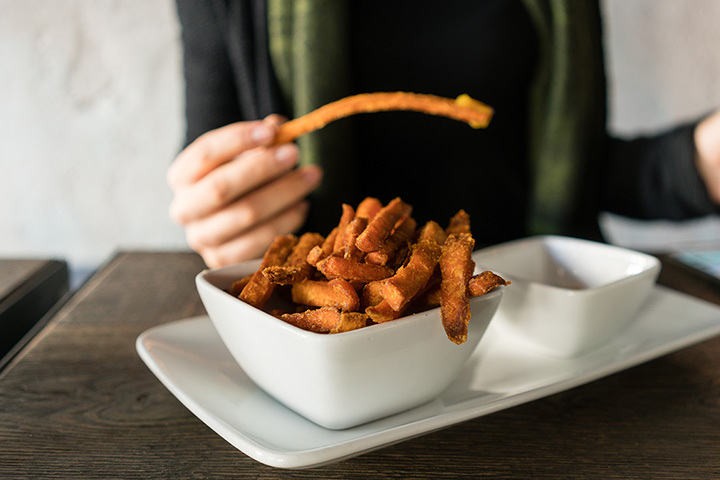 One bite of their scrumptious sweet potato fries will quickly make it your top spot for fries. If sweet’s not your thing, they also have delicious traditional fries that pair well with their gyros. Their award-winning steaks are best complemented by their equally impressive fries. Fresh potatoes are thick-sliced in house and cooked to order to give you the best quality and flavor. Combine these fries with a ribeye and basket of yeast rolls and you’ve got a meal fit for royalty. This nostalgic diner is serving up hamburgers and shakes that will have you longing for yesterday, but their fries are the true heroes of the menu. Get ‘em plain or sweet, add chili or cheese—however you like them, you’ll eat them all. There are three other in this Alabama-only mini-chain: Birmingham, Irondale, Homewood, and Gardendale. This restaurant’s unique domed structure isn’t the only thing you’ll remember. Their fries are simply perfect. Gently fried, lightly seasoned, and always hot, you’ll want to finish your share before you dig into the main course. The fries at Panin Pete’s has three things going for them: they’re always hot and fresh, they’re crispy, and you get a ton of ‘em. Fans agree they have the best “fast food” fries in the state, and there’s plenty of fun, unique items on the menu to eat with them. They’ve got another location in Mobile if Fairhope isn’t in your scope.